Competition Commission, the statutory body of India, has imposed a fine of Rs 136 crore (around $ 21.1 million) after finding it guilty of abusing its dominant position in India. The amount of penalty charges is equivalent to about 5 percent of Google’s revenue from India. The case was filed back in 2012 by Matrimony.com, former Bharat Matrimony (Case No. 7), and Consumer Unity & Trust Society (Case No. 30), when they complained the watchdog CCI about Google’s about Google’s anti-competitive behavior. Alphabet Inc’s search giant provides online search services and advertisement space- AdWords and AdSense. The complaints submitted to the CCI focused on Google’s biased search results, in which it was favoring Google’s own services and partners, “through manually manipulating its search results to the advantage of its vertical partners,” the report said. It was also pointed in the filing that Google, in addition to running its search engine services, Google also provides a large number of vertical search services like YouTube, Google News, Google Maps etc. It has also been averred that in order to promote it’s own services Google is mixing many of its vertical’s search results in its organic search results. For example, when a user searches the name of a song on Google, he receives links to videos of that song from Google Video or YouTube, both of which are properties owned by Google. It was also pointed that Google’s own websites would appear on top of the search results whether they are relevant to the search or not. In this way it was leveraging its dominance in the online search segment. Google has also been prohibiting advertisers from advertising on words that might appear like Google’s trademarked words. CCI has concluded abuse of dominance by pointing out that Google is doing the following activities against which the fine has been imposed. Google blends its vertical’s services with the organic search (genuine search by a user) thereby promoting its own services and steering the user to Google’s own services such as maps, e-commerce,etc. Google is indulging in discretionary behavior as it regards its compensation policy, that is, it does not compensate advertisers for losses that can be attributed to Google’s system error. Prohibitions imposed under the negotiated search intermediation agreements upon the publishers have been held to be unfair as they restricted the choice of these partners and prevented them from using the search services provided by competing search engines. “Google was found to be indulging in practices of search bias and by doing so, it causes harm to its competitors as well as to users. Investigation has revealed that Google integrates/ blends its own specialised/ vertical search services/options/features in its online general web search services in Universal Results and Commercial units using mechanisms that do not apply in an equivalent manner to non-Google websites/ web content. Moreover, it offers its own specialised search features (Commercial Units, Universal Results etc.) at prominent ranks or positions on the Search Engine Results Page (SERP)” the report stated. Complex nature of determination of Quality Score coupled with non-disclosure of adequate information to advertisers renders the entire process opaque and nontransparent and susceptible to manipulation which amounts to imposition of unfair conditions on advertisers in violation of Section 4(2)(a)(i) of the Act. Google was, thus, found to be abusing its dominant position by not making such details available to its advertisers and following nontransparent procedure. Google was found to be using its dominant position in Online General Web Search Service and Online Search Advertising Service to impose certain restrictive conditions in its agreements for syndicate search and advertising services in violation of Section 4(2)(e) and Section 4(2)(c) of the Act. Google also entered into agreements with customers licensing AdWords API from it. Google’s AdWords API agreements with third party tool developer entities contain certain restrictive clauses that have anticompetitive effects which the DG found to be in violation of the provisions of Section 4(2)(a)(i), 4(2)(b)(ii) and Section 4(2)(c) of the Act. 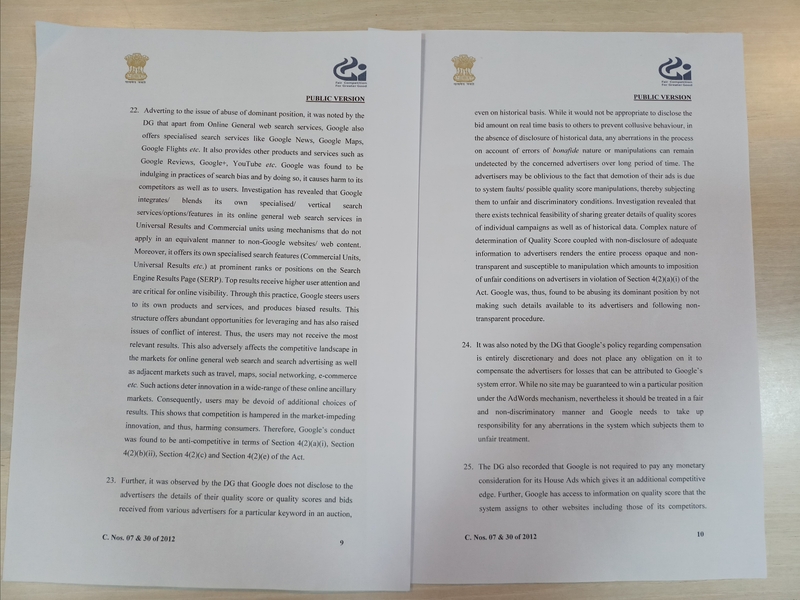 Resultantly, it was concluded by the DG that Google abused its dominant position in the relevant markets of “Online General Web Search Service in India” and “Online Search Advertising in India”, in violation of Section 4(2)(a)(i), 4(2)(b)(ii), 4(2)(c) and Section 4(2)(e) of the Act. Not the first time that Google is fined in a country! Besides India, Google has been in the trials against anti-trust claims in the countries like- Canada, Russia, Brazil, Argentina, South Korea, Germany, France and Italy. A similar settlement in Russia in April 2017, costed the search engine giant a hefty fine of $7.85 million and a commitment to behavioral change. In June, it was once again hit with a penalty, this time in Europe, where the European Commission had imposed $2.7 billion for violating competition law.